The anxiety that 3D printing could lead to a new front in the war against counterfeiting and trademark infringement has increased exponentially this year, thanks to a predicted ‘explosion’ in the new technology due to the expiration of some key patents. Welcome new innovations could ease those worries but there is still much to be done. 3D printing and additive manufacturing technology is advancing at a startling rate, meaning more companies are introducing it as a means of cheaper and more efficient manufacturing. It also means much easier pirating of protected designs, as it requires just a digital 3D blueprint to be downloaded and printed to create an identical-looking copy. Gartner predicted earlier in the year that the emergence of 3D printing will create “major challenges” in relations to IP theft, predicting a loss “of at least $100 billion per year in IP globally” by 2018. 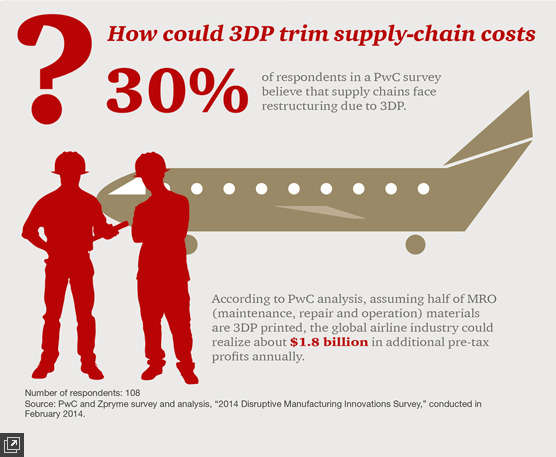 How could 3D Printing trim supply chain costs? Author Supercharg3dPosted on 1st July 2014 28th January 2017 Format ImageCategories Supply Chain ImpactTags Costs, Supply ChainLeave a comment on How could 3D Printing trim supply chain costs?